Wow! Blog readers, I wish you had been there tonight. 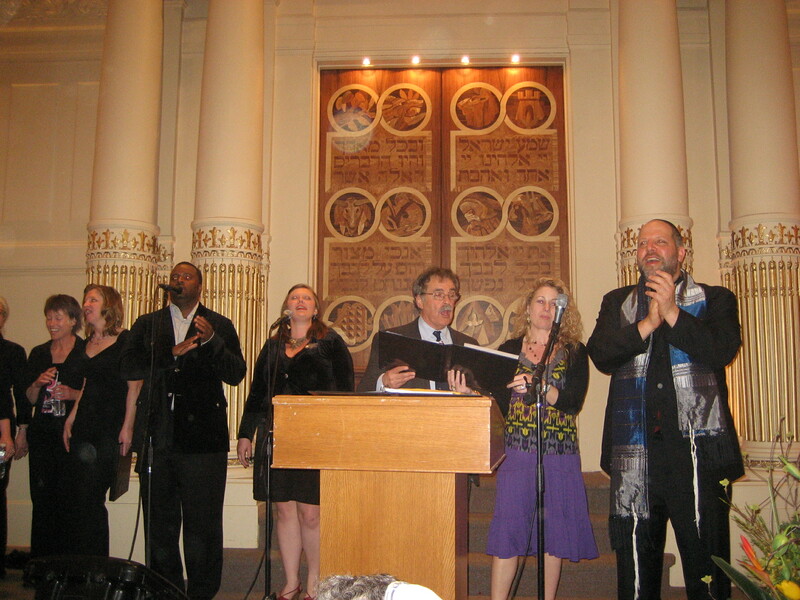 My synagogue had a special Friday night service – the first-ever performance of a Gospel Shabbat composed by Stephen Saxon, a cantor and jazz musician from San Ramon, California. It was amazing. While a typical Friday night service might draw 50 to 100 congregants, the sanctuary was packed with about 700 people, both Temple Sinai members and visitors. It felt like a high holiday service: Our rabbi even joked, as he introduced Saxon, that it was time to sing Kol Nidrei. 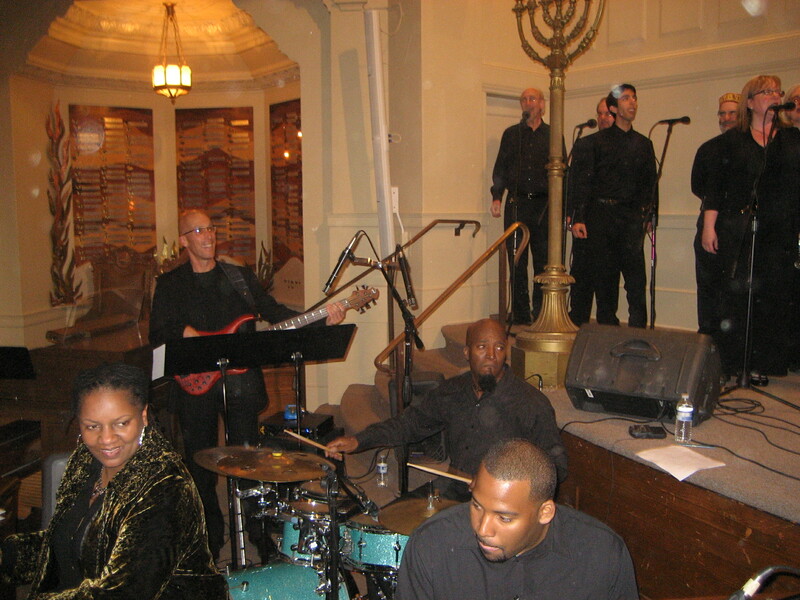 Saxon was accompanied by an a cappella choir called Flying Without Instruments, as well as a quartet of gospel musicians from nearby Oakland churches. He had basically set an entire Shabbat service to gospel music – taking each major prayer (the Barchu, the Sh’ma, the Amidah, the Mi Shebeirach etc.) and creating an English-language gospel version of it. He got the whole room singing immediately with an opening “Hallelujah” composition. In between the musical numbers, he introduced and explained each part of the service. People were on their feet – swaying, singing, clapping – for much of the evening. But it didn’t feel compromised or heretical – the Hebrew translations were accurate in meaning if not literal, and Saxon’s introductions also made clear that this was all in the structure and context of a Jewish Shabbat service. Overall it was uplifting and inspiring, and engaging in a visceral way that doesn’t often happen with more traditional Reform services. Sometimes it’s good to take familiar things and put them in an entirely new context. And the gospel context is so rich – the legacy of African-American oppression and transcendence, the great music, the way you are caught up and carried along in the rhythm and choruses. Classical Reform Judaism is often focused on “head.” This added epic doses of heart, gut, and even hips. He noted that both gospel and Jewish traditions stand against oppression and discrimination, and he read a statement by the Reform movement opposing the Arizona law. Dozens of people stayed after the service officially ended, swaying and clapping and continuing to sing the final song, Saxon’s gospel transformation of Oseh Shalom. Saxon has a web site with some of his music, and you can listen to his Gospel Shabbat compositions here. But a caveat — the online versions are him singing solo, and they are a pale shadow of how things sounded at temple with the live choir, the band, and a sanctuary full of hundreds of people singing. Listen, but add your imagination. This entry was posted on April 30, 2010 at 10:43 pm and is filed under Judaism. You can follow any responses to this entry through the RSS 2.0 feed. You can leave a response, or trackback from your own site. If they decide to do it again, maybe you can post on FB or to an email list. I’d love to go. Thanks! I modified the post to include the link. I guess I was in the minority – I didn’t like the Gospel Service. It felt more like a performance than something spiritual and I didn’t connect with it at all.